The mainstream history of Islam has been rewritten and heavily censored. Unjustifiably few characters are highlighted more than others who were more deserving. In the process people who embraced the ideals of Prophet Muhammad, people who played a very pivotal role both in his personal life as well as the life of the community were sidelined, often very marginalized in history. Baraka is one such figure in the history of Islam. About Baraka the Prophet used to say, "After my mother, she is my mother. She is the remainder from my close ones (Ahli)." Leaving Allah (SWT) and His Messengers to follow, the Sunnis claim to follow their sunni Caliphs, Sheiahs claim to follow their Sheiah Imams. But strangely enough, they all claim that they all originate to the Message of the last Messenger, Muhammad (SAWS). Sunnis commonly praise and celebrate Ayeshah, while Sheiah commemorate Fatimah more prominently, whereas, the unmatchable great ladies, Barakah and Khadeejah are eclipsed by both the communities. The Mollahs and Maulanas of Indian Sub-continent hold "Milad" of the Prophet (SAWS), and lecture and mention for hours together, the brief period of the biological parents of the child Muhammad, Abdullah and Aminah, and even mention Haleemah, the breast feeder on payment of Muhammad for a brief period of two years only. Barakah, Umme Ayman, and Umme Usamah, who cared, raised and accomplished Muhammad to be the last and the final Messenger of Allah! The last Messenger of Allah (SAWS) has regarded and loved her till his death as his mother, Khadeejah respected her as the mother-in-law! The Messenger of Allah (SAWS) used to rise to see her and kiss her on her forehead. Sometimes he used to take Abu Bakr, Umar and other prominent companions with him, while going to see Barakah, and greet her saying, "O my mother, how are you?" Do you know how the blessed great lady used to reply! The Messenger of Allah used to greet saying. The great lady used to reciprocate. "Yes, O the Messenger of Allah, I am well, till Islam is well!" How warm is the greetings, and how divine is the reply! She is well, if Islam is well! Can any body cite another example of such wish of greetings, in the history of Islam? If Islam is well, she is will, if Islam is unwell, she is unwell! Have we heard such wishes from Ayeshah, Fatimah or any other Ummahatul Mumineen ever? Or from any man like Abu Bakr, Ali and Umar etc.? Is not she, the motherly manifestation of Islam, who was destined by Allah (SWT) to raise the final Messenger for his prophethood, and from the prophethood till his death? Read more to learn and believe the greatness of "Great Barakah." آه لَق د انْ ق طَ عَ ا ل وحْ ي مِ ن ا ل سمَ اء. "Alas! the line of revelation has been snapped off." How clear was the concept about Islam, its Message and the Messenger in the mind of Barakah. Such is called crystal clear. 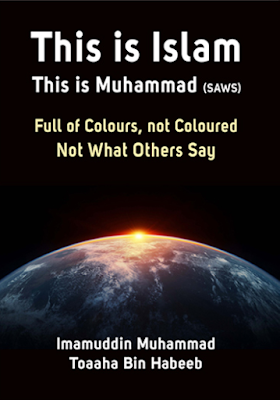 (Credit: This is Islam,This is Muhammad (saws) by Imamuddin Muhammad Toaaha Bin Habeeb). I am sharing here the chapter on Baraka from the valuable book by Imamuddin Toaaha Bin Habeeb called "This is Islam, This is Muhmmad (saws)." Who was Barakah? Barakah was an Ethiopian black girl in her teens, Abdullah Ibn Abdul Muttalib, the father of the prophet bought her. He bought her from the slave market of Makkah before he married Aminah Bint Wahb, the mother of Muhammad. When Abdullah married Aminah, Barakah was the lone maid who lived in his house and looked after him and his wife Aminah. ‘After two weeks of Abdullah's marriage with Aminah, his father Abdul Muttalib visited our house and said. "O Abdullah, get ready for business trip with the caravan which is due to leave for Syria”. "Strange! Strange!! How will my husband leave me for a business trip to Syria when I am still a new bride and the bridal make up of mine is not yet over"? Aminah cried. ‘When I saw Aminah fell senseless, I cried in sorrow and pain, "O my mistress! O my mistress!!" Then she came to her sense and opened her eyes, and I saw tears were rolling down her cheeks and she said in choked voice: "Barakah, please take me to my bed’. Aminah remained bed ridden for long time, did not speak to any one except Abdul Muttalib, the respected and kind old man, her father-in-law. Barakah stops for some time, again she starts narrating the story, she looks at the sky, the tears are rolling out of her eyes and flashed her cheeks. ‘Well! O my mistress’, I replied. She said, "I dreamt this night that a light is beaming out of my womb, which illuminates the circumference of Makhah and its valley". She replied, "Yes Barakah, but I do not feel any of the complications that other women suffer". "Because the ruler of Yamen Abraha Al-Ashram has arrived with a massive army to over-run Makkah, demolish Kaabah, humiliate Qureish and captivate the men, women and children." Aminah said, "Father I am grieved as you see, and weak to the extent that I am unable to move to the mountains." Abdul Muttalib said: "I am afraid about you and the embryo that you are carrying." Aminah replied: "Father neither Abraha Al-Ashram can enter Makkah, nor destroy Kaabah, because Kaabah has got its Lord to protect it." "But Aminah did not speak." Then Abdul Muttalib cried angrily, and said: "Aminah yeh, get up and prepare with your luggage, and you Barakah help Aminah for journey. I will be waiting for you at my house to leave together for the mountains." ‘When Abdul Muttalib heard what Aminah said, opened his eyes and glared, and raised his face towards the sky and said to himself vociferately: "Dream! illusion ! imagination ???!!! ‘I kept myself completely tagged with Aminah day and night, nursing and comforting her. She was bearing tremendous agony for the absence of her husband Abdullah. I used to sleep by her side and hear her lamentation, as if she was whispering with her absent husband. I used to wake up from my sleep hearing her lamentation and console her, and give her strength to light her agony. After two months, the first column of the caravan started reaching back to Makkah, and every caravan used to be received and welcomed by their near and dear ones with applause. I used to go out secretly to the house of Abdul Muttalib to inquire about the return of Abdullah, but used to get no news about him. So I used to return calmly, without letting Aminah know anything, so that she was not further strained, by what I heard or saw. All the caravans at last reached back to Makkah, but Abdullah did not come back. Abdul Muttalib and the people of Makkah celebrated the birth of the child Muhammad. But Haleemah took him as she came late. Because her donkey was very weak. But when she took Muhammad with her, the donkey became fast like a horse. ‘When Muhammad reached six, his mother Aminah intended to visit the grave of her husband in Madinah. I was afraid to think about this tedious journey. Muhammad's grandfather Abdul Muttalib came to persuade Aminah back from her intention. But Aminah insisted on this visit ignoring all the difficulties and dangers. So, one morning we three, Aminah, Muhammad and I sat on a small palanquin put on a strong camel and set for Madinah with a big caravan which left for Syria on a business trip. When the caravan reached the outskirts of Makkah by two miles, the caravan singers started their rhymes melodiously and the camel started speeding up. ‘Our caravan was travelling from Makkah to Madinah, the tears of Aminah never dried. I was trying to brave and console her by narrating tales and stories, so that she gets some sort of relief. But child Muhammad was sleeping on my lap twisting his arms round my neck. Whenever there was a jolt in the palanquin on camel's back, Muhammad used to awake. But again he used to fall asleep. We reached Madinah after ten days of journey, and we stayed in the hospitality of Bani An Najjar, the maternals of Muhammad. On the second day of our arrival, Aminah went to visit the grave of Abdullah and shed her tears on it to lighten her grief. Muhammad did not go to see his father's grave on that visit. He was a mere child of six years. We left him in the house of his maternals to play and gay with the children of his age. Aminah kept on visiting the grave of her husband every day from morning to evening for long forty days. That shattered her health, and she became weak nearly unable to walk. We again started our journey back to Makkah from Madinah. On our way, the fatal calamity fell upon us. Aminah fell sick with fever and her temperature kept rising. She lost her sense. We were left behind by the caravan and stayed in the middle way between Makkah and Madinah in a village called 'Al Abwa'. I tried all my efforts to treat and nurse her by all that I had with me of herbal drugs. But her health deteriorated from bad to worse. "Barakah, I am going to leave this world within minutes. I make will for you about my son Muhammad. He had lost his father when he was in my womb, and now he is going to lose his mother before his eyes. You will be his mother, O Barakah, and never leave him." These words were her last words that tore my heart and I started crying and wailing. Seeing my wailing Muhammad became frightened and started crying and wailing with me, and he fell between the arms of his mother, and embraced her in a way that suffocate her. I eased the hands of Muhammad. Aminah cried, and with a tremble she became silent and left us forever. ‘With these two hands of mine I dug the grave of Aminah in the sand, and laid her in rest in it, and then shed the remaining tears of mine to its last drop. I came back with the orphan child Muhammad to Makkah and stayed in the house of Abdul Muttalib. There I looked after Muhammad as his mother. When Abdul Muttalib died, I shifted with Muhammad to the house of his uncle Abu Talib. Then Muhammad was only eight years old. From then I reared and cared him with all my affection and love, till he became a full grown man of twenty five years and got married with the noble lady Khadeejah Bint Khuwailad. And then I started living with Muhammad in the house of Khadeejah. Neither I did leave him nor he did leave me ever. One day Muhammad called me. He always used to call me "Ya Ammah" (O my mother) then said: "Now I am a married man and you are still without marriage! What is your opinion if anyone comes to propose you for marriage?" "This is Barakah, she is my mother after my mother, she is the remnant of my family." And then Khadeejah looked at me and said: "You have sacrifised your life for Muhammad, now he wants to return some of your gifts. For my sake and Muhammad's sake please accept our proposal before you are caught by old age." I said: "Yes, I accept." [+] You may download the full book in English. Click on the cover to be directed to the book. Baraka was a monumental figure in the life of Prophet Muhammad, She was the foster mother of the Prophet and yet her role is suppressed in the mainstream history. Its the racist misleading leadership of early days of Islam who did so.